Along the muddy river bank hundreds of men pack down under small plastic sheets to avoid the direct sun and to take respite from the 38 degree heat. The men cram into the small bamboo shops beside the muddy river. The valley and river littered with generators and large hoses that the miners use in their hunt for gold. It is Sunday and the workers are having a break from work. In this remote area o f Karen State almost everything is available – phone calls, money transfers, food, clothing, alcohol, electronics, machinery and there is even the Internet. Thousands of people from all over Burma flood into the Baw Lu stream that links to Tenasserim River, in Southern Burma, to seek their fortunes from digging gold. Oo Pa Pu is from Tha Ra Bwe village, and he owns a gold mine plot along the Baw Lu stream. He told to Karen News his business depends on luck. 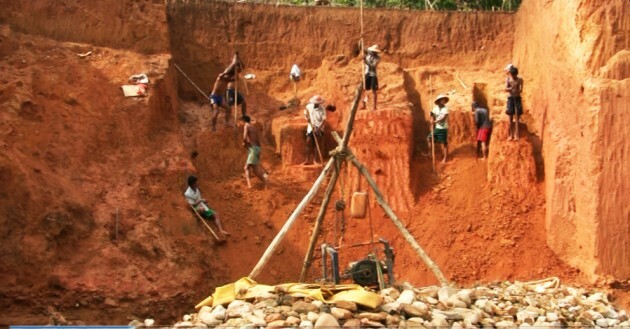 Many of the gold mining operations are small scale. There are over 120 machines in the gold mining in Baw Lu stream area. Workers and mine owners come from all over Burma, seeking their fortunes. Oo Pa Pu has been mining in the area for more that 10 months. Oo Tu Tu is with another miner Kaw Maw Praw, another gold miner who says. Htun Win, a worker who has traveled down from from Kachin State said. Htun Linn Oo is a mine worker who has been in the area for more than a month said. Workers working on small scale gold mines are provide with food and only get paid if the mine finds gold. Workers get one third (about 33.33%) of the gold they find. Maung Hsa Naing is a gold worker and says.